Aside from voting thru text using Philippines mobile network, ABS CBN Pilipinas Got Talent 5 (PGT5) allow us to vote online. This is the first time in country where talent search taps the giant company Google for online voting system. Where ever you are as long as you are connected to the internet you can easily cast your vote on your favorite PGT 5 finalist. The usual mobile voting is still up to those who want to prefer text voting using ABS CBN Mobile, Smart, Sun Cellular and Globe. 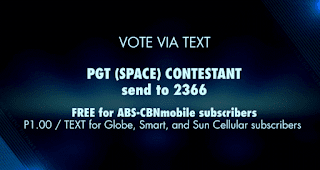 You will be charge P1 per vote or if you’re ABS CBN Mobile subscriber you can text your vote for free. See:How to Vote PGT Season 6 2018. Just go to www.google.com.ph then don’t forget to login or sign-in your Google account. After logging in, type PGT5 on Google Search then click search. 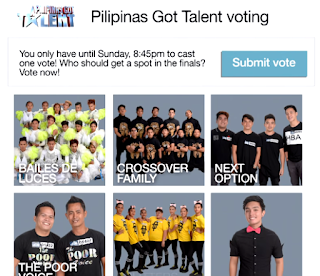 List of contestants available for voting will automatically appear after typing ‘PGT5’. Look for your bet and click its picture then Submit vote. You can choose 1 or both mechanics to vote as long you have internet connection and enough load balance on your mobile account. That’s it. Good luck to all Pilipinas Got Talent 5 finalist.